I don’t normally finish books in two days, but this one was a quick read. The short page count helped, but it was primarily the tension in the story that kept me enthralled. Once I was in ORSK, I couldn’t leave until the mystery was solved. First, the cover. If you’ve been in an IKEA, the design concept is entirely familiar to you. 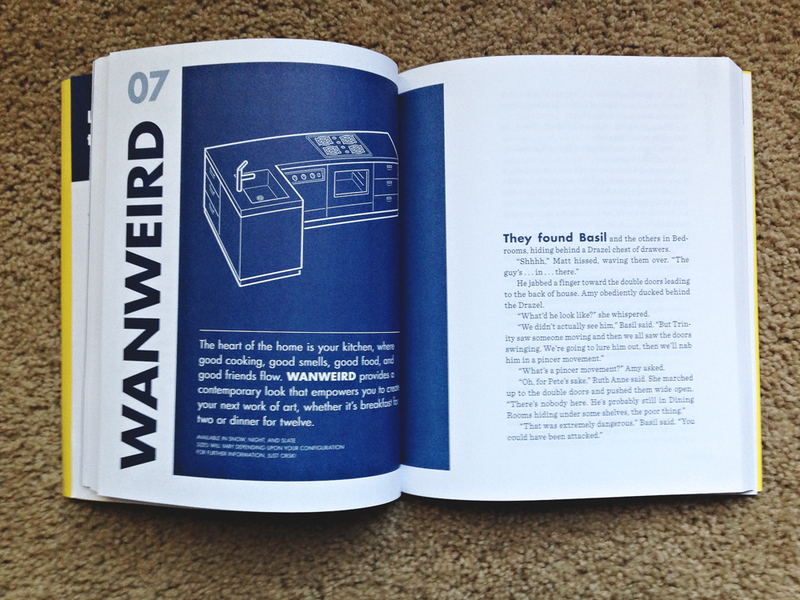 In every way the book is designed to make you think of IKEA. The author even references IKEA just in case you’re not sure. The store, in this case, is ORSK, the American version of IKEA and it’s designed to entrap its customers in a counterclockwise maze of home goods and office furniture (just like IKEA). You can eat meatballs in the cafeteria and peruse the make-shift kitchens and living rooms and pretend they’re your own (just like IKEA). Everything is hard to pronounce so you can’t call anything by it’s actual name (just like IKEA). You get the gist. The story begins with Amy, a dissatisfied ORSK employee, who’s asked to participate in a secret overnight shift to help determine why strange things are happening at the store – odd smells and stains, broken pieces of furniture, other unexplained occurrences that aren’t being caught on the security cameras. Along with Amy’s boss, a third employee agrees to the overnight shift and thus begins the adventure. The entire book lasts one full night in ORSK. I cannot overstate the brilliance of the book design. Every chapter is named after a piece of furniture that applies to the content of the story. 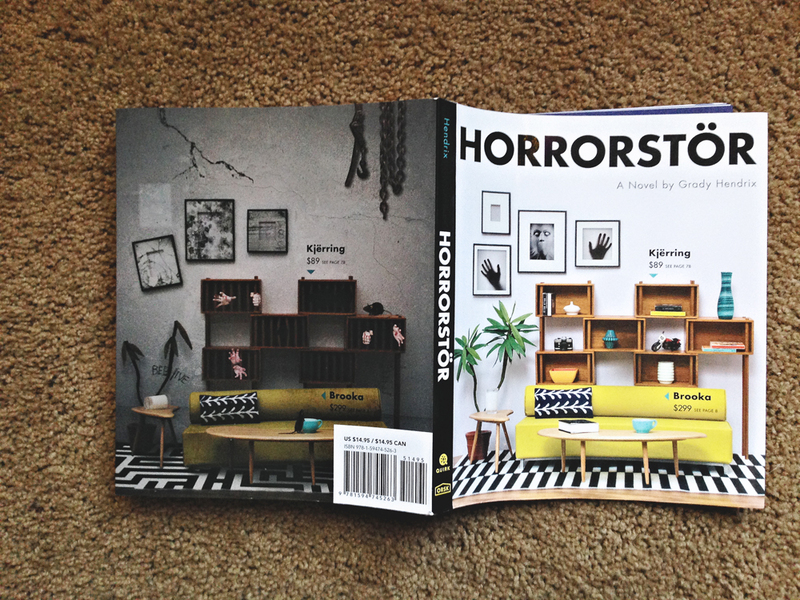 In keeping with the horror genre, the chapters (and furniture) become more gruesome. 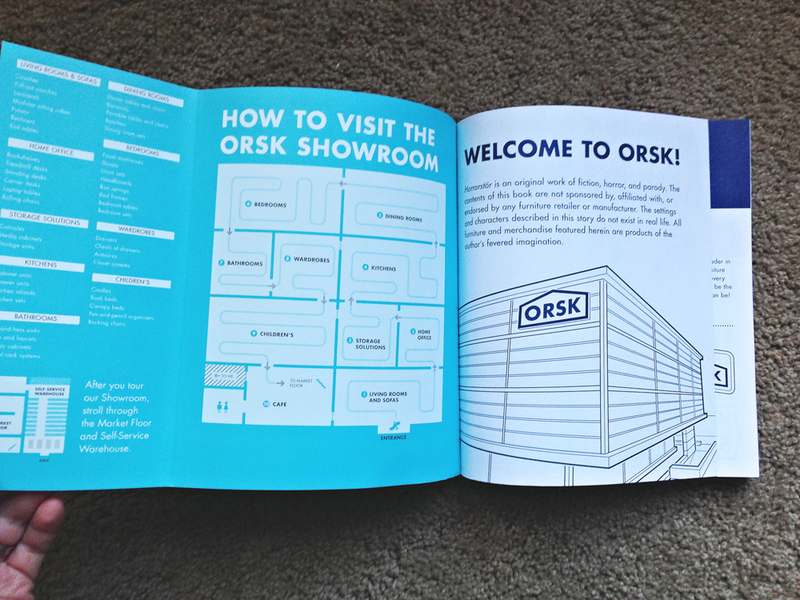 The front matter of the book offers you a showroom map so you can keep track of where the characters are throughout the story. This is not just about the solving of a crime. It’s a true horror story with blood and pus and other things that made me squirm. I don’t normally read this sort of fiction but aesthetics of Horrorstör captured me. I love IKEA, with its cheap batteries and meatballs with gravy. I read this book if only to enjoy the parody of the Swedish box store. In the end, it was a thrilling and creative read. Jeremy’s First Hand-Held Device. Lord please.